Bespin is the third planet in the Bespin system. Secluded from Galactic turmoil by its location in a little-visited sector of space, Bespin is an astrophysical rarity. An immense gas giant surrounded by a number of moons, the planet contains a band of habitable atmosphere among its endless clouds. Bespin is located just off the Corellian Trade Spine, in the Ison Corridor. Among the other worlds orbiting Bespin's star are Miser, Orin and the Velser's Ring asteroid belt. A gaseous planet with billowy, pink and purple clouds, the planet Bespin lies far from most commercial traffic, and is close to the barren Anoat system. 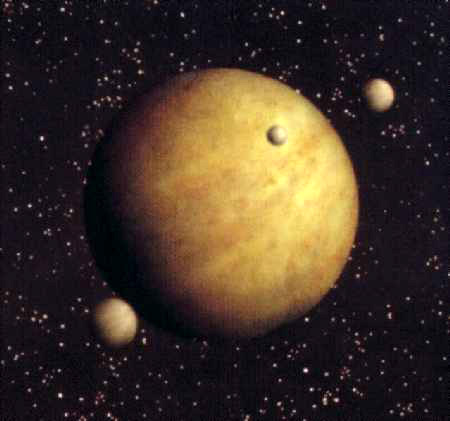 Like most gas giants, Bespin has multiple moons, the two most prominent being the "Twins," H'gaard and Drudonna. The Bespin planet is some 118,000 kilometers in diameter. Like most gas giants, Bespin is made up of a core and three concentric constituent layers. The core (6,000 kilometers in radius) is composed of solid metal. The next layer is a 22,000-kilometer deep sea of liquid rethen. At this level, the rethen is so compacted that its liquefied form resembles a metal, with extreme temperature levels. The next level of liquid rethen is not as metallic, and is 30,000 kilometers deep. Here, the pressure would crush a capital ship to a compact size, and the temperatures are scalding. Above this level is the 1,000 kilometer-thick cloud layer. At the bottom of the cloud layer, where it touches the liquid rethen sea, temperatures reach 6,000 standard degrees. About 150 kilometers down from space, and 30 kilometers deep, is Bespin's Life Zone, where temperature, oxygen, and pressure are perfect for the existence of human life. It is in this level that Cloud City, a Tibanna gas-mining colony, was built. The main hazard of Bespin's bio-zone comes from its intense storms that build up and travel across the surface. The clouds of Bespin hold many treasures. The rarified gasses are known to produce rare and valuable gems. Bespin also is a natural factory for spin-sealed Tibanna gas. Though Tibanna can be found elsewhere, the industrial process of spin-sealing it for certain applications is very costly. The dynamics of Bespin's atmosphere naturally spin-seals the Tibanna at an atomic level, making prospecting for gas on Bespin an often-lucrative venture. Bespin completes a day every 12 standard hours. Bespin's year is equivalent to 14 standard years. The planet is home to a number of native life forms, none of them intelligent. Among these are the beldons, the velkers, the glowers and the pinks. The skies are also home to a number of transplanted life forms, such as Alderaanian thrantas. Cloud City was formerly under the administration of Lando Calrissian. It is with mixed emotions that historians of the Rebellion consider Bespin. It is remembered both as a beautiful haven, and as a trap for Luke Skywalker and Han Solo during the Galactic Civil War. During the tail end of the Galactic Civil War, the Empire garrisoned Bespin and took over Cloud City, though the outpost and the planet enjoyed freedom after the defeat of the Emperor at the Battle of Endor.